Students and teachers can be affected by anxiety about maths, science and technology (STEM) subjects, which are often perceived as ‘hard’ subjects. Negative beliefs, attitudes and emotions formed by past experiences can prevent effective learning in the present. Learning to ‘take off the emotional handbrake’ helps students to make progress. Working with partners in South Africa, Warwick academics are testing a suite of tools to help teachers and learners manage their emotions and become more effective in the classroom. In a new international collaboration, experts from the University of Warwick and the University of the Witwatersrand, Johannesburg are training South African teachers in a set of research-informed techniques to address anxiety around science, maths and technology subjects and help learners develop more confidence in their own ability to learn. The project draws on the work of Sue Johnston-Wilder of the University of Warwick’s Centre for Education Studies, an expert in how the affective domain - the attitudes, beliefs and emotions held by a student - impacts ability to learn mathematics, and Dr Audrey Msimanga of the University of the Witwatersrand, who investigates communication barriers to learning in STEM subjects. An initial workshop, funded by the Warwick Impact Acceleration Account, has already taken place at Warwick with South African teachers, advisers and academics to refine the project so that it fully reflects local needs, and to provide training in the five tools at the heart of the project. The resources will now be trialled in South African schools in the Gauteng East, Ekurhuleni, and Johannesburg Central districts. Each tool is developed from robust educational and pedagogical theory and will help teachers and learners draw on the most up-to-date thinking on developing resilience, tackling anxiety, and overcoming communication barriers. Sue Johnston-Wilder said: “Strong negative emotions are known to shut down cognitive functions. A student who lacks confidence in their maths skills or who suffers anxiety is not able to fully engage with the subject and succeed in their learning. When we teach students how to be more resilient, and equip them with strategies to check their anxiety, we see improvement in their learning. The Growth Zone Model, developed at Warwick by Sue Johnston-Wilder and Dr Clare Lee: this helps a student distinguish between their comfort zone, where they are confident in their STEM skills, the growth zone, where they are challenged but supported, and the danger zone where they feel out of control and under too much stress to learn effectively. The grid of communication styles, developed in South Africa by Dr Msimanga, from work by Scott and Mortimer: this helps the teacher adapt to the child’s preferred learning language. The relaxation response: just as the fight or flight response can be triggered, a relaxation response can be triggered with techniques such as controlled breathing or exercise. The ladder of accessibility: this tool helps to bridge the gap between the learner’s current understanding and the expert’s understanding of a topic. The Explore-Options-Actions framework: this sets out a framework for helping a learner solve a problem which has them stumped, based on Egan’s ‘skilled helper’. Participating teachers will receive an ‘intervention handbook’ and join an online support group to help them apply the ideas and cascade successful practice within their own schools and districts. Dr Msimanga said: “South Africa is facing some unique challenges in its maths and science education. It is a country with a very young population, but a significant part of that population of young people is underachieving in science and maths, to an extent that could do real harm to the country’s economy. “The country has already invested in improving the subject knowledge of its STEM teachers. We believe that, by tackling the emotional barriers to learning, our project will lead to a significant improvement in engagement and attainment in STEM subjects at school level, which will in the long run increase the number of qualified scientists, mathematicians and engineers in a position to contribute to South Africa’s economic growth. The toolkit will also be used by the University’s Warwick in Africa project. 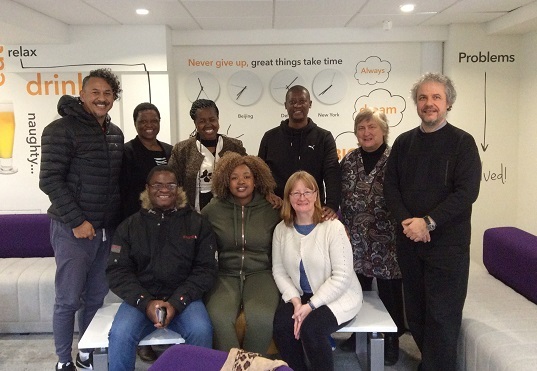 PHOTO: Audrey Msimanga (standing, second from left) and Sue Johnston-Wilder (standing, second from right) with workshop participants. * The Growth Zone Model: Johnston-Wilder, S. and Lee, C. (2008), Does Articulation Matter when Learning Mathematics? Proceedings of the British Society for Research into Learning Mathematics, 2008, British Society for Research into Learning Mathematics, 28 (3), 54 – 59. * The grid of communication styles: Msimanga, A. (2015), Towards a dialogic discourse in a mathematics classroom: Opening and closing verbal interaction in Adler, J. and Sfard, A (eds) Research for Educational Change: Transforming researchers' insights into improvement in mathematics teaching and learning 2017, Routledge.